Back to the future with thermoelectric materials; rock ‘n’ roll makes solar panels more efficient. In the hunt for sources of renewable energy, researchers at ETH Zurich have gone back to a 19th century discovery. Thermoelectric materials have the remarkable property that heating them creates a small electrical current. But enhancing this current to a level compatible with the needs of modern technologies has revealed an extraordinary challenge for scientists of the last decades, despite important theoretical and experimental efforts. Now a novel approach could lead to substantial progress. At ETH Zurich the quantum optics group of Tilman Esslinger has created a key model to better understand the fundamental phenomena—a thermoelectric material emulator. It happened almost by chance: In Zurich group member Jean-Philippe Brantut and his colleagues had just set up a new experiment when visiting professor Antoine Georges from the Collège de France and University of Geneva had a look at the laboratory and was thrilled because the setup was something they had been looking for. Georges returned the very next day with a bunch of equations to convince the researchers that their experiment was an ideal way to study thermoelectricity. This triggered a fruitful collaboration between theorists in Paris, Bonn and Geneva and experimentalists in Zurich. The thermoelectric material emulator sits in a vacuum chamber made out of glass. It encloses a gas of Lithium atoms. Using lasers the gas is cooled down to very low temperatures, close to absolute zero. Under these conditions the atoms in the gas behave like the electrons in a material. To simulate thermoelectricity the atoms are trapped by a set of laser beams. These create a spatially varying structure in which the atoms move like electrons in a material. With this setup they managed to simulate thermoelectricity that is high in efficiency. How much better do solar panels perform while being made to listen to pop and rock music? Researchers at Imperial College in London have found that it is as much as 40%! The research showed that high-pitched sounds, like those common in pop and rock music, caused the greatest improvement in the solar cells’ power output. Classical music, with typically lower pitched sounds, still increased the cells’ output, but not as much. This discovery makes it possible to power a wider range of devices with solar energy than at present, as scientists can improve the efficiency of solar cells using the ambient, or background, noise present in many environments. They found that sound levels as low as 75 decibels (equivalent to a typical roadside noise or a printer in an office) could significantly improve the performance of the solar cells tested in the study. 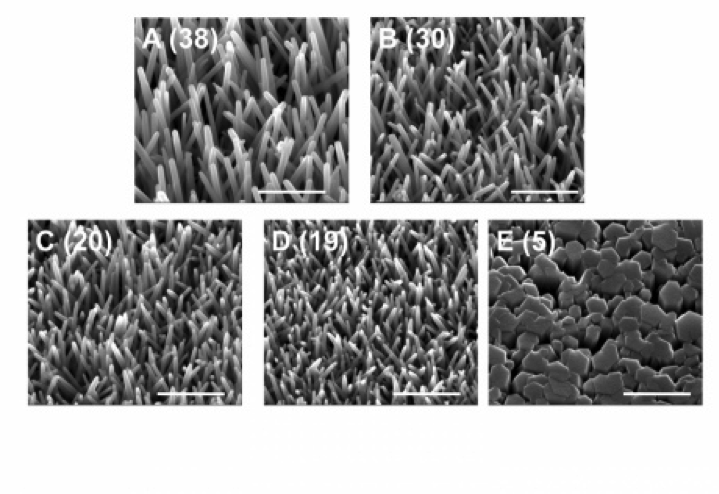 Zinc oxide nanorods were manufactured into the solar cells, increasing their efficiency when sound waves were played. “We thought the soundwaves, which produce random fluctuations, would cancel each other out and so didn’t expect to see any significant overall effect on the power output,” said James Durrant, Professor of Photochemistry in Imperial’s Department of Chemistry, who co-led the study. But the random fluctuations from the sound didn’t cancel each other out, and some frequencies seemed to amplify the solar cell output. The increase in power was significant considering how little sound energy they injected. Perhaps the same phenomena happens to people when they listen to rock music; they have more energy and this in turn explains why rock music is so popular. AC/DC anyone?